BACKGROUND AND PURPOSE: Liquid embolic agents may have potential as a therapeutic option to reconstruct a defective vessel wall. We evaluated the feasibility of transarterial glue embolization in surgically constructed carotid artery aneurysms. METHODS: Reconstruction of arterial wall defects with use of glue casts was performed in 16 surgically constructed aneurysms of carotid arteries in rabbits. Via the transfemoral route, glue was injected without balloon protection through a microcatheter into the aneurysmal sac with (n = 8) and without (n = 8) a framework of coils. To identify safe and effective methods, four concentrations (28%, 33%, 40%, 50%) of glue-iodized oil mixtures were used in four aneurysms each. Immediate (n = 16) and 2-month follow-up (n = 10) postembolization angiograms were obtained to evaluate the residual aneurysmal sac and the carotid artery patency. RESULTS: Continuous column injection of glue was possible in all aneurysms, without fragmented migration of the injected glue cast. Catheter sticking or breakage did not occur during catheter retrieval. Glue embolization without a framework of coils (n = 8) resulted in complete obliteration of the aneurysmal sac in five aneurysms and incomplete obliteration with a small residual lumen in three. Two aneurysms resulted in carotid occlusion after catheter removal. A follow-up angiogram (n = 4) showed decreased residual lumen in two aneurysms, no change in the complete aneurysm occlusion in one, and carotid occlusion in one. Glue embolization with a coil framework (n = 8) resulted in complete obliteration of the aneurysmal sac in six aneurysms and incomplete obliteration with a small residual lumen in two. A small amount of spillage occurred in one owing to the improper position of the microcatheter caused by a difficult neck angle to the parent artery. Follow-up angiograms (n = 6) showed decreased residual lumen in one of two aneurysms and no change of the complete occlusion in five of six aneurysms. CONCLUSION: Effective glue embolization into the aneurysmal sac is technically feasible. Microcatheter position within the aneurysm, concentration of glue, and direction of the aneurysmal neck angle all must be considered. With a coil framework, glue injection was more complete, without deformity or spillage of the glue from the aneurysm. Because degeneration or defect of the internal elastic lamina associated with hemodynamic stress leads to aneurysm formation, fundamental reconstruction of the wall defect caused by an aneurysm maintains blood flow and protects against rupture of the aneurysmal wall due to hemodynamic stress (1–3). Since the advent of Guglielmi detachable coils (GDCs; Target Therapeutics/Boston Scientific; Boston, MA), newly designed detachable coils have provided safe and effective endovascular treatment for cerebral aneurysms (4). However, some limitations have been identified with the use of GDCs in cases of incomplete packing and coil compaction, leading to incomplete therapy or regrowing of the aneurysm (5). Because of the different mode of delivery into the target lesion, the advantage of a liquid embolic agent conforming to the target structure during injection has not been fully considered; this property of reconstructing the vessel wall can thus justify the use of liquid embolic agents in aneurysms (6–14). Two kinds of intraarterial liquid embolic agents have been used: polymerizing (6, 7) and precipitating (8–14) agents. Although glue (n-butyl 2-cyanoacrylate) has been used as an effective polymerizing liquid embolic agent for brain vascular lesions, the applications to aneurysms have been limited seemingly because of the technical difficulties of using glue (6, 7). The precipitating agent has been studied and effectively used for brain vascular lesions including aneurysm (14), but there were still some limitations. One disadvantage in using the precipitating agent is that it takes a rather long injection time to solidify the precipitating agent firmly because solvents must be washed out, especially when balloon protection is being used for flow arrest (9). Solvent also has the potential risk of leading to endoluminal damage in distal vessels, although there is no harm in small doses (15). The purpose of this study was to assess the technical feasibility of using glue to embolize aneurysms. To identify the ideal technical conditions for using glue, we evaluated its continuous injectability without fragmentation, its appropriate concentration, optimum injection time, visibility, and the probability of its sticking to a catheter. All animal experiments were conducted in accordance with the policies established by the Animal Care Committee at the Asan Institute for Life Science Research Center (16). After an overnight fast, New Zealand white rabbits were premedicated with intramuscular ketamin and xylazine (25 and 3 mg/kg, respectively). Intravenous anesthesia was maintained through a marginal ear vein with a 5% pentothal sodium drip. After a 6-cm-long linear incision parallel to the sternocliedomastoid muscle was made in the left anterior lateral aspect of the neck, the left external jugular vein was surgically exposed. The isolated segments were obtained by using 3–0 silk, with proximal and distal ligation of 2-cm lengths of vessel as the vein pouch. The adventitia of the segment was cleaned, and then the vein segment was placed in heparinized saline (25 IU/mL) at room temperature. The right common carotid artery was exposed, and temporary atraumatic vascular clamps were placed in the proximal and distal portions of the anastomotic site. A 4-mm-long elliptical arteriotomy was fashioned on the outer lateral side of the artery. Between one end of the tubular segment of the vein and the arteriotomized side, an end-to-side anastomosis was performed by using interrupted 8–0 monofilament nylon sutures. After the atraumatic vascular clamps were removed, the anastomotic area was examined to allow no bleeding, and blood flow passed through it freely. Aneurysms were allowed to mature for at least 14 days before angiography. Angiograms were obtained via the femoral route after insertion of a 4F sheath within 2 months following surgery. Heparine 50 IU/kg of body weight was injected after insertion of a femoral sheath. Sixteen aneurysms in 15 rabbits (mean weight, 4.3 kg) were identified on angiograms to have an appropriate size and shape of aneurysm for this study. We used only one aneurysm per rabbit since a rabbit with two aneurysms died after embolization probably owing to the long procedure time in both sides. The mean size of the aneurysms was 9 × 6 mm. After confirmation of an aneurysm, a nonhydrophilic microcatheter with an inner lumen of 0.015–0.020 inch was introduced into the aneurysmal sac for embolization as deep as possible. We tested a range of glue concentrations between 28% and 50% to find the appropriate concentration of the glue-iodized oil mixture in which slow polymerization of the glue cast would occur and safe catheter retrieval would be possible (17). Four concentrations (28%, 33%, 40%, 50%) of glue (B. Brown, Melsungen, Germany) and iodized oil (Lipiodol; Laboratoire Guerbet, Aulnay-sous-Bois, France) mixtures were used in four aneurysms each. Glue was injected at the tangential view of the aneurysm neck into the parent artery under high-resolution, subtracted, real-time fluoroscopic road mapping. The glue injection technique was as described previously (18). The glue mixture was loaded in the 1-mL Luer-Lok syringe and injected continuously after vigorous flushing of the microcatheter with 5% dextrose solution. The amount of glue injection was as much as possible in each injection unless there was any fragmentaion of glue cast or overflow of the injected glue in the aneurysm into the parent artery, because the purpose of this study was to evaluate the safety and feasibility of glue injection at its maximum dose and not to evaluate effectiveness of the partial injection. The embolization effect was graded as complete when there was no residual lumen within the aneurysm on the immediate and follow-up angiograms and incomplete when a residual lumen remained within the aneurysm. In these eight aneurysms, the amount of injected glue ranged from 0.4 to 0.8 mL (mean, 0.6 mL). Injection time of the glue ranged from 1 minute 26 seconds to 3 minutes 35 seconds (mean, 2 minutes 26 seconds). An immediate postembolization angiogram was obtained to evaluate the residual aneurysmal sac and patency of the carotid artery. A 2-month follow-up angiogram was obtained in four aneurysms. Two rabbits were not recovered immediately after embolization because of bleeding at the femoral artery puncture site in one and owing to long anesthetic time in the other, which habored two aneurysms. Afterward, we used only one aneurysm per rabbit. One rabbit died 2 weeks after the procedure because of emaciation that seemed not related to any neurologic deficit. In these eight aneurysms, after introduction of a GDC (5–8 mm in diameter), glue was injected through a microcatheter placed in the center of the coil mesh. The size and length of the coils were adjusted according to the size of the aneurysm. The amount of injected glue ranged from 0.2 to 0.6 mL (mean, 0.4 mL). The glue injection time ranged from 33 seconds to 2 minutes 3 seconds (mean, 1 minute 22 seconds). A 2-month follow-up angiogram was obtained in six aneurysms. Two-month follow-up angiograms of two aneurysms in two rabbits were not available. One rabbit died during recovery after embolization. Carotid angiogram obtained through the femoral route immediately after expiration revealed no significant difference in the aneurysm except a diffuse vascular luminal narrowing that was likely caused by loss of vascular tone. Another rabbit recovered well from the procedure, but the follow-up record was not available. We used a total of 16 aneurysms for this study. The Table shows the results of embolization in each aneurysm. Sixteen aneurysms were divided into two groups for glue embolization: one with and one without GDCs. Two aneurysms were used for each of four glue concentrations. Continuous intraaneurysmal injection was possible in all eight aneurysms, resulting in complete obliteration in five aneurysms (Fig 1) and incomplete obliteration in three (Table 1). Two of five complete obliterations resulted in carotid arterial occlusion after retrieval of the microcatheter (Fig 2). Aneurysms with incomplete obliteration showed complete obliteration in one and decreased residual lumen in another on 1- and 2-month follow-up angiograms. There was resistance during retrieval of the microcatheter at the end of glue injection in two aneurysms in which 33% and 50% concentrations of glue were used, respectively. Complete obliteration in one aneurysm and occlusion of the carotid artery in one revealed no change on the 2-month follow-up studies. Aneurysm 1. Complete glue embolization of aneurysm without a coil framework. A, After obtaining this preembolization angiogram, 50% glue was injected for 2 minutes and 28 seconds under subtracted, real-time road-map fluoroscopy. B and C, Frozen images of early (B) and late (C) phases show slow enlargement of the cast without fragmentation. D and E, Angiograms obtained immediately after embolization (D) and at 2-month follow-up (E) show no residual lumen in the aneurysm and a patent carotid artery. Aneurysm 4. Partially embolized aneurysm without a coil framework. A, After obtaining this preembolization angiogram, 40% glue was injected for 1 minute and 26 seconds under subtracted, real-time road-map fluoroscopy. B–D, Frozen images of the early (B), middle (C), and late (D) phases show leakage of the cast along the wall. E and F, Angiograms obtained immediately after embolization (E) and at 2-month follow-up (F) show persistent occlusion of the carotid artery. Complete control of the glue injection and obliteration of the aneurysmal lumen were possible in six aneurysms (Fig 3). Incomplete injection of glue occurred in one aneurysm because of premature cast formation (Fig 4). In one case, glue leaked into the parent artery when glue was injected at the margin of the aneurysm outside the coil mesh because the introduction of a microcatheter into the center of the coil mesh was impossible owing to the acutely angled neck of the aneurysm (Fig 5). Two-month follow-up was performed and confirmed the complete obliteration and patency of the parent artery in five of six aneurysms. An incompletely obliterated aneurysm showed a more decreased residual aneurysmal lumen on the follow-up angiogram. The dimension of the coil was reduced in all aneurysms without reopening the aneurysmal lumen (Figs 3–5). Reduction of the coil mesh volume suggested that the size of the aneurysm decreased after glue embolization. Aneurysm 16. Complete embolization with a coil framework. A and B, After obtaining the preembolization angiogram (A), an 8 x 20-cm GDC was introduced into the aneurysm to make a coil framework (B) and 28% glue was injected for 2 minutes and 3 seconds under subtracted, real-time road-map fluoroscopy. C and D, Frozen images of the early (C) and late (D) phases. E and F, Angiorams obtained immediately after embolization (E) and at 2-month follow-up (F) reveal persistent obliteration of the aneurysm. Aneurysm 9. Partially embolized aneurysm after making a coil framework. 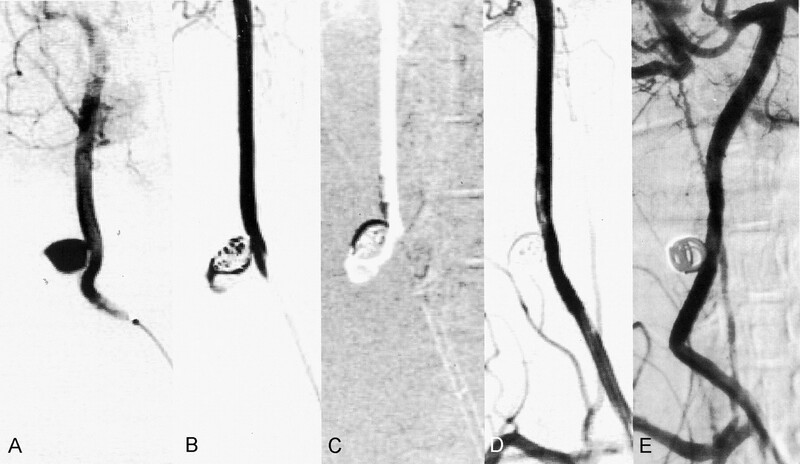 A–C, After obtaining a preembolization angiogram (A), an 8 × 20-cm GDC was introduced into the aneurysm to make a coil framework (B) and 50% glue was injected for 1 minute 35 seconds under subtracted, real-time road-map fluoroscopy (C). Glue could not be further injected probably because of the premature cast within the microcatheter. D and E, Angiogram obtained immediately after embolization (D) shows a residual lumen within the aneurysm that appears smaller on the 2-month follow-up angiogram (E). Aneurysm 13. Glue spillage during injection after making a coil framework. 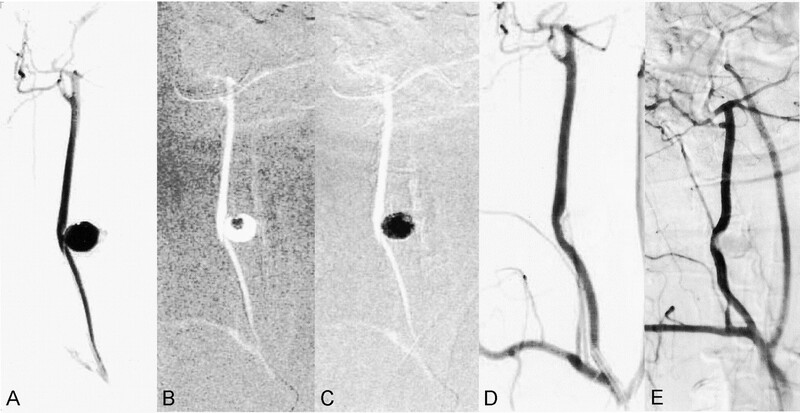 A–C, After obtaining a preembolization angiogram (A), a 5 × 15-cm GDC was introduced into the aneurysm to make a coil framework (B), and 33% glue was injected for 33 seconds under subtracted, real-time road-map fluoroscopy (C). Note the acute angle of the aneurysmal neck to the parent carotid artery. D and E, Angiogram obtained immediately after embolization (D) shows a filling defect caused by spilled glue, which has been absorbed on the 2-month follow-up angiogram (E). Endovascular treatment of cerebral aneurysms has become an alternative to conventional neurosurgical clipping. The advent of GDCs provided safe and effective treatment for a large population of cerebral aneurysms (4). Some anatomic and physical limitations and difficuties in dense packing associated with the use of GDCs in aneurysms have been identified because GDCs are less effective in wide-necked or large or giant aneurysms (5, 13). In this type of aneurysm, it is difficult to achieve complete packing and control of the aneurysm inflow with GDC technology. Use of liquid embolic agents is a possible alternative for the treatment of some cerebral aneurysms (6–14). However, these therapeutic techniques have not been generally accepted owing to intrinsic technical limitations. One major limitation has existed in the delivery mode of liquid embolic agent into the sac of the aneurysm without any possibility of repositioning or retrieval (9). Some experimental and clinical methods have been tested to decrease distal migration of the liquid embolic agent, such as intraaneurysmal flow control with proximal balloon protection, balloon inflation across the neck of the aneurysm, and use of metallic stents (9, 19). Our study revealed that glue can be safely used in aneurysm embolization with or without a coil framework; however, complete control of the obliteration is better achieved with a coil framework. To achieve maximal effect and safety, glue with a low concentration (28%) had to be injected under precise fluoroscopic control after making a coil framework within the aneurysm. Although fragmentation and distal migration of the glue cast did not occur in our study, making a glue cast within the coil frame can have the further protective effect of holding the cast within the coils. Our experiment demonstrated that a very round cast is formed within the aneurysmal lumen, filling the peripheral portion of the aneurysmal lumen once the tip of the microcatheter is well positioned in the center of the coil mesh. In aneurysms that preclude stable positioning of the microcatheter owing to the acute angle of the neck to the parent artery, glue embolization into the aneurysm can be dangerous because of the increased risk of glue spillage into the parent artery, as in the case demonstrated in Fig 4. The mechanism of glue cast formation seems to differ during the slow injection of a low concentration of glue. When glue is injected at the marginal side of the laminar flow of the fast flow, a tubelike glue cast is formed along the flow and then a round glue cast is formed in the area with the disturbed flow (20). Continuous injection is possible through the center portion of the cast column while active polymerization occurs at the surface of the cast column. This continuous injection results in a threadlike column in laminar flow and a round cast in the disturbed flow. Therefore, disturbed flow as in aneurysm is mandatory to obtain a round glue cast that conforms to the aneurysmal wall. If a microcatheter is in the turbulent flow of the nidus of an arteriovenous malformation, intranidal glue injection can have the same result whether the tip is in the wedged position or not (18). Even though the cast surface is already hardened, it takes more time for the core of the glue cast to be solidified. Therefore, we presume that the glue cast can come out without filling the aneurysmal sac when there is well-preserved, fast laminar flow in the aneurysmal sac and the coil frame is not sufficient to prevent rapid laminar flow into the aneurysm, thereby making more coils necessary. One of the reasons for making a GDC frame is to induce disturbed flow from rapid laminar flow to make the glue cast more stable within the GDC frame. We observed resistance of the microcatheter during retrieval in two of 16 aneurysms, although there was no sticking of the microcatheter to the glue cast. Resistance of the microcatheter during retrieval was not noted in vivo, and in vitro studies of the 28% glue concentration we recommended (17). Without the coil framework, deformity of the glue cast after retrieval of the microcatheter may lead to occlusion of the carotid artery, as was the case in two aneurysms in our study. Therefore, we expect that the protective effect of the coil mesh can further minimize possible deformity of the glue cast within the aneurysmal sac during catheter retrieval. Our results show that balloon protection of the flow or aneurysm neck is not necessary. If the balloon is used to protect the neck portion of the aneurysm, closure of the neck may lead to increased intraaneurysmal pressure (9) or even have the potential of sticking to the balloon. The great danger associated with balloon usage is that the balloon precludes contact of the flowing blood with the unpolymerized glue within the aneurysm. When optimal polymerization does not occur at the surface of the glue cast, deflation of the balloon before solid polymerization may cause serious distal migration (9, 19). We do not think this risk is the same as in the other liquid embolic agents like Onyx (Micro Therapeutics Inc, Irvine, CA), because aneurysmal neck protection is known to be well controlled by repeated ballooning during injection of Onyx (14). The glue and iodized oil mixture in our study had excellent visibility under fluoroscopy during embolization even after the coil mesh was formed. In comparison, Onyx when dissolved in its organic solvent dimethyl sulfoxide has poor visualization caused by the higher radiopacity of the GDC (9). In addition to the optimal visibility of liquid embolic agents, these agents should be used under high-quality, subtracted, real-time fluoroscopic guidance to avoid leakage into the parent artery and distal migration of the glue. Gravity may affect the mode of shaping or formation of the glue cast, although this was not considered in our study because it was absolutely necessary to demonstrate a tangential view of the neck. Some of our incomplete embolizations may have been caused by the gravity effect, especially in aneurysms embolized without a coil mesh. Changing the position of the target lesion according to dependency may be required if gravity is a concern (8, 9). Our study also revealed that aneurysm size decreased on follow-up studies. Compared with the aneurysms embolized with GDCs, the decrease in size of the embolized aneurysm on follow-up angiograms seemed to result from the glue absorption and contraction of the coils, as shown in our cases. However, we did not clarify the exact mechanism of the aneurysm because we did not examine its pathology. We postulate the following three possible mechanisms of coil retraction: A portion of glue is absorbed from the aneurysm; clot or other blood components are absorbed, leaving the glue cast inside the aneurysm; or there is another unidentified mechanism. If the glue is absorbed from the aneurysm, the following three mechanisms could be postulated: Glue in the aneurysm is absorbed by the blood; glue in the aneurysm is absorbed through the aneurysmal wall after an inflammatory process caused by the glue; or there is extraluminal migration of glue after angionecrosis of the aneurysmal wall. Extraluminal migration was demonstrated in half of the cases embolized with glue of 50–100% concentrations in the intraarterial space of swine rete milabile (21). The histopathologic study revealed that glue moved to an extravascular location through disrupted internal elastic lamina within 2 months after glue embolization. To the best of our knowledge, no other explanation is available in the literature. Further study will be necessary to prove the mechanism of the glue reaction embolized in an aneurysm. We believe that the decrease of aneurysm size after glue embolization can result in a mass-relieving effect in a giant aneurysm that cannot be achieved by coil embolization alone. Although the rabbit aneurysm model is known to be an optimal tool for endovascular research (22), our experiment may be limited in its application to human aneurysms because side-wall aneurysms can have recirculation or stagnated blood within the lumen of the aneurysm (23). This can cause the glue to deposit and remain within the aneurysm as opposed to washing out of it. However, the fundamental patterns of intraaneurysmal flow in side-wall aneurysms are composed of inflow, circulating flow, and outflow (24, 25). The inflow, which enters the aneurysm only during the systolic phase, is strongly influenced by the position and size of the neck and the flow ratio into the distal branch. The inflow zone is a determining factor in the placement and stability of embolic materials within the aneurysm and in the thrombosis of an aneurysm (25). We believe that continuous and stable glue injection is possible in the aneurysm with a coil mesh because the coil can partly protect the flow from the inflow zone. Such an effect can be demonstrated by contrast material injection into the aneurysm after making a coil frame. If the flow in the aneurysm is judged to be too fast to inject glue, additional coiling will be warranted until stagnation of the contrast material is sufficient to allow injection of the glue. Direct extension of our results to clinical study may have limitations because the hemodynamics of the surgically constructed side-wall aneurysm model in rabbit are different from those of a human aneurysm. In addition, the safety and stability of the embolic effect need to be confirmed after long-term follow-up and pathologic studies. Because our study is a feasibility study, the effects and follow-up results for each aneurysm were not considered together in our study. They must be analyzed separately because seeking an appropriate concentration range for this technique is one of the main purposes of this study. In conclusion, glue embolization of aneurysms is technically feasible without neck protection of the flow with balloon. The position of the catheter in relation to the neck of the aneurysm must be considered for the safe and effective embolization of an aneurysm. Although any glue concentration between 28% and 50% can be used for this purpose, the lower concentration of 28% is the best for stable glue casting and safe catheter retrieval. Efficacy of glue embolization is maximized by using a coil framework. However, further studies are necessary to clarify glue-aneurysmal wall reaction and long-term follow-up results of this technique. The potential in using glue (n-butyl 2-cyanoacrylate) to obliterate aneurysms may broaden the application of the endovascular procedure in the management of aneurysms and may possibly be applied in reducing the potential difficulty and risk of complete packing with detachable coils. We thank Bonie Hami, MA, Department of Radiology, University Hospitals of Cleveland, Cleveland, OH, for editorial assistance in manuscript preparation and acknowledge the comments made by Jacques Moret, MD, the Service de Neuroradiologie Interventionnelle, Foundation Ophthalmologique Rothschild. We also thank Kil Soo Kim, DVM, PhD, for his contribution to this study as much as the principal investigator, and also Target Therapeutics of Boston Scientific Corporation for providing us GDCs and microcatheters. Supported by a research grant from the Korea Science and Engineering Foundation (981–0708-070–2). Moret JG. One-year experience and follow-up of 18 intracranial aneurysms treated with Onyx injection: analysis of results, prospective (abstr). Presented at the 39th annual meeting of the American Society of Neuroradiology, Boston, April2001 . Accepted after revision April 13, 2003.